Cameron Frye’s contemporary glass house from the classic 1986 comedy Ferris Bueller’s Day Off is on the market, so I thought it would be fun to take a look back at the sets from the movie. We’ll get to Cameron’s in a minute, but first let’s take a look at Ferris’s traditional Colonial, which was (supposedly) in the Chicago suburbs. It was also featured in the thriller Red Dragon and the comedy Not Another Teen Movie. The kitchen is classic 1986. Check out those fluorescent lighted ceiling tiles and the gold fridge. Emilio Estevez, who had a starring role in The Breakfast Club a few years earlier, turned down a chance to play Cameron. His brother, Charlie Sheen, was interested enough in the film to play a small part, but other Hughes alumni, including Molly Ringwald and Michael Anthony Hall, thought they could be in the Buellerverse in some way. Ringwald asked the director for a chance to play Sloane, but Hughes believed the role was just too big for the biggest teen star in America at the time. While Hall believes Hughes wrote the lead role for him as well as the role of Duckie in Pretty in Pink, but after Hall took roles with other directors, Hughes cast other actors to play those parts. Hughes maintained Matthew Broderick was always supposed to be Ferris. 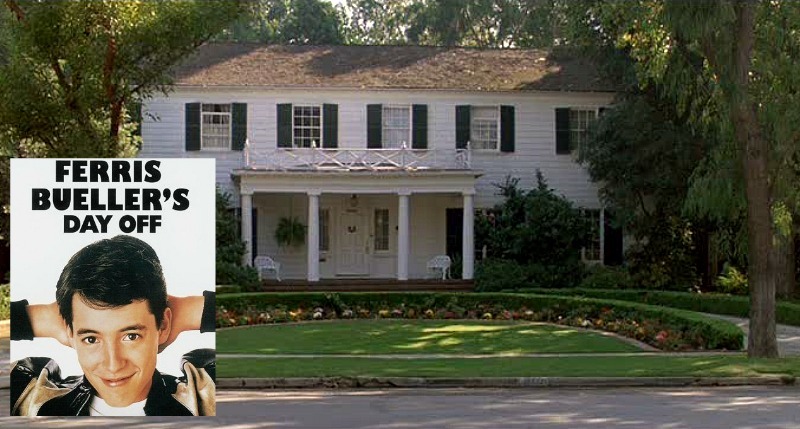 According to Zillow, the Bueller house was built in 1928. It has 7 bedrooms, 5 baths, and 4,900 square feet. Cameron’s house is on the market in Highland Park, Illinois, for $2.3 million. The house has 4 bedrooms, 4 baths, and 5,300 square feet. Known as the Ben Rose Home, the two-building structure was constructed mostly of steel and glass. It was designed by architects A. James Speyer and David Haid in 1953 and sits atop a wooded ravine. THE BEN ROSE HOME: a mid-century modern architectural treasure cantilevered over the ravines, the 2 steel and glass buildings have incredible vistas of the surrounding woods. Designed by A. James Speyer protege of Mies Van der Rohe & David Haid. Main house: 4 bedrms/3baths Pavilion/guest house: kitchen/ bath + 4 car interior parking. New interior/exterior steel/window renovation+new roofs-carpeting and more! Have you heard the theory that everything that happens in this movie is in Cameron’s head? Yep, some people believe Ferris Bueller was just a figment of his imagination. Want it? Check the listing for more photos and information. UPDATE: It sold in 2014 for $1.06 million, less than half of its original asking price. Thanks to its new owners, it’s undergoing a major renovation that you can read about here. 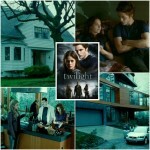 This house reminds me of the Cullen’s house in Twilight! Arleen @ Seasons for All at Home’s last blog post..Survey Results ~ Decorate a Room in Blue and White! 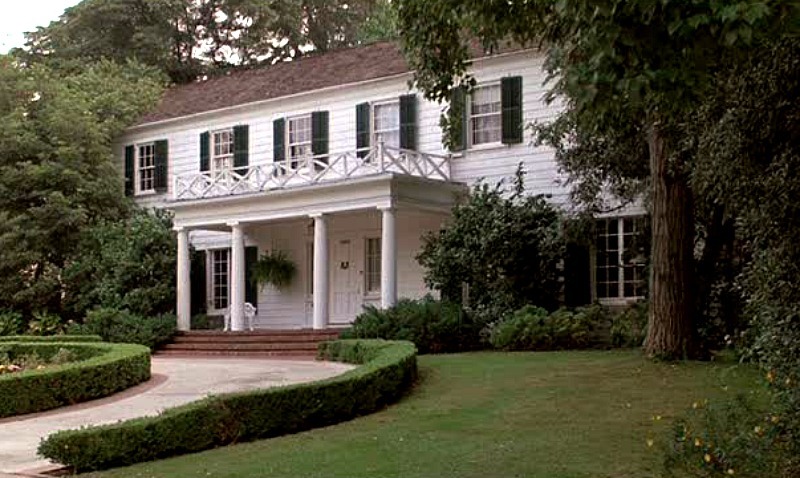 This is one of my favourite movies, but I must say I do not care for Cameron’s house at all. Seems really sterile and not homey at all. I sure wouldn’t pay $2 million for it. Carrie’s last blog post..They ARE Listening! I’de go for this house in a heart beat, too bad its way out of my price range. Thanks for sharing though, great find! I’m fascinated by Cameron’s house. It did seem super cold & sterile in the movie but I love how completely unique it is! I have to go look at the MLS listing for more photos of it. Loved that movie. When it came out I remember standing in line forever. I never had the nerve to do what Ferris, Cameron and Sloane but I loved living thru them! I’d love to see the Fry house in person. desiree’s last blog post..Hooked On Outdoor Fireplaces! What a stunning property. I have a fantasy of myself as the kind of person who is tidy enough and organized enough to live in a home like that. Never mind wealthy enough! All I remember about the movie (other than the parking attendants joy riding the Ferrari) is Cameron’s garage. But a 42X35 family room? That could be good. *sigh*… what a great memory shaker!! Thanks for the great smiles! I love traditional homes, but it is interesting to look at the contemporary ones. I have to comment on the pictures of Jean’s room though, because I had the exact same bedding. It’s Laura Ashley Castleberry. I loved it. Actually, I have to say, for a young girl I still rather love it. 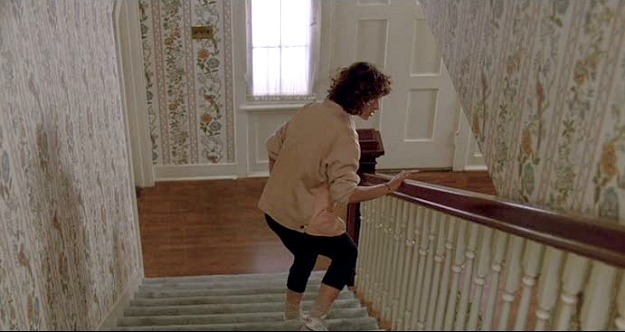 But the wallpaper in the stairwell is hideous. Thanks for the link, I was way to lazy to find it myself. If Shauna buys it, will she have to give up throwing stones? I came up with a bunch of silly trivia questions but though better of posting them and co-opting the comment string. Thanks for posting this Julia. I heard about the sale of the glass house, last week, but haven’t had time to find out more. The Ben Rose house is the house of my dreams! Thanks Julia for the photos, quite fun to see this Monday morning. It would be like living in a tree house! What a FUN movie that was! 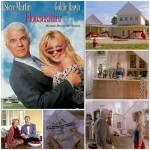 Two FAB houses… I’m sure the decor has changed a bit in Ferris’ home… less wallpaper maybe! This is such a fun post!! I love Cameron’s house — it’s almost live you’re living right in the trees, with all those glass windows. I’m sort of like Cameron, but I’m trying to be more like Ferris!! DesignTies’s last blog post..From 1939 Sad to 2009 FAB ~ My Kitchen! Thank you for sharing these house gems with us…I always enjoy your movie sets! 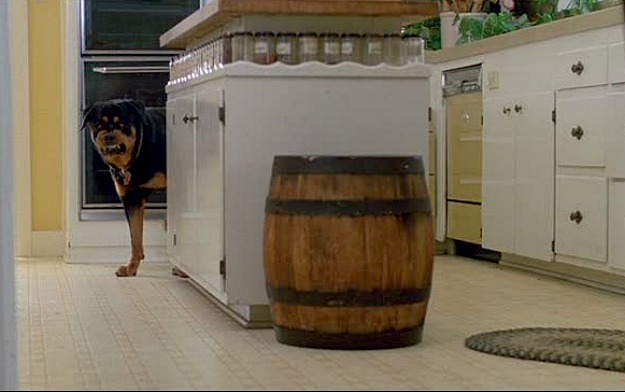 I watched Alvin and the Chipmunks this weekend (withmy nephew) and LOVED Dave’s house! Sounds silly but I did! Love the setting and the architectural touches…many like that in LA. That would be a great one to do and not one people nesessaruly watch for decor tips! But I am ALWAYS looking at the decor! *laugh* Even with talking chipmunks around. It looks like, in the 2nd picture of the kitchen, that there are glass spice jars in a small shelf under the island countertop. How cool is that??? You’d have to get on you knees to read the labels. How uncomfortable is that??? wow… first of all, if you owned a terrain like this one, this is one beautiful demonstration of “thinking outside the box” for building a house – no pun intended. and like the first lady said, it is very much like that in the movie “twilight” – a very spectacular way of living in nature, or bringing nature into your living. btw… cool blog julia! i very much enjoy it! Wow! That would be great, I’m not sure my wife would want me to start acting like a teenager again. Which I would if I owned either of the homes. Amanda @ Serenity Now’s last blog post..Salvation Army Saves the Day! Thanks for showing the house…it’s so neat! Not my style, but I still love it! That was one of the best movies ever!!! I’m a little perplexed that there are gold appliances in the kitchen. In 1986? I always equate harvest gold with the 70s…am I wrong? I’m assuming that in a movie things would be “up to date”. I’m also freaked out that this movie is 23 years old. That means I’m old. First, I wanted to say how unbelievably flattered I am that you stopped by my blog!! I have been “lurking” on yours for months and adore everything you put on here! Second….FAVE movie, hands down. How cool is all this that you’ve posted about? Thanks for sharing!! Kristi @ El Rancho Dominguez’s last blog post..Amen to Summer! I want Cameron’s house! And I also want to go watch the movie again. Tracey’s last blog post..Winter Friendly Outdoors! Thanks for posting both Ferris’ and Cameron’s houses. I always wondered if the Ben Rose house was designed Mies van der Rohe and now I know. Whenever I think of Chicago, I think of this great movie. I heard about the listing on the radio yesterday. I assumed the DJ was talking about the Beuller house but since you mentioned the updated listing for 1/11, I guess it was Cam’s house she was talking about. Anyway, she said the house was going for 1.6 million and continued, “Who has that kind of money? Anyone? Anyone?” Made my day! I love the Ben Rose house but, as a new homeowner buying heating oil for the first time, I can’t help but wonder how well those glass walls are insulated!